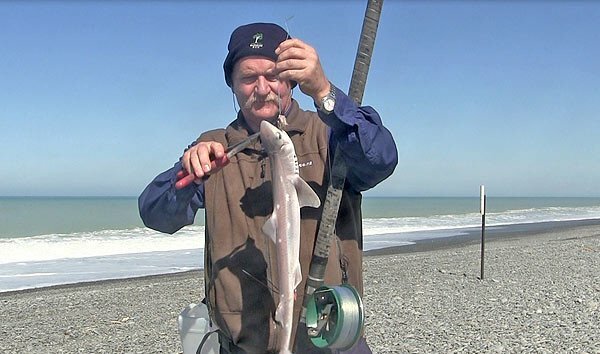 Allan Burgess with a spiny dogfish from the beach at South Rakaia on an Alvey 650C. Most anglers have their favourite fishing reels. These are their “go-to” reels they know they can rely on to get the job done. 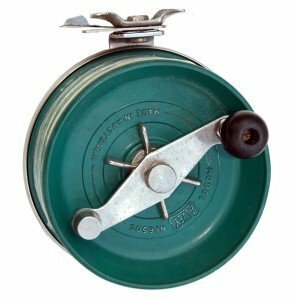 A favourite reel often has another more difficult to define characteristic; that being it is very comfortable to use. It just “feels” right! 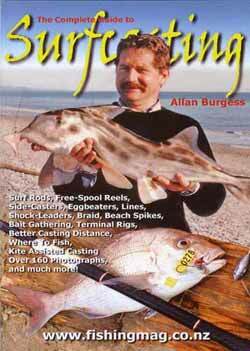 For me when it comes to surfcasting that reel is my old green Alvey 650c. It is at least 20 years old. 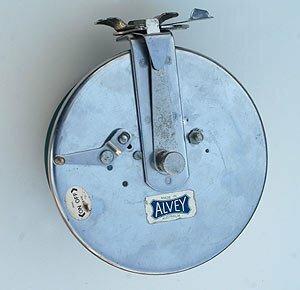 Alvey are still making them today, although the colour of the injection moulded fibre glass spool is now black, and the handle is a slightly different shape. It is still very much the same reel. 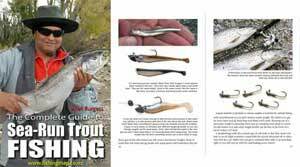 You can see them here on Alvey’s website where there is a picture of an angler with a big mulloway taken on the same green version reviewed here. Alvery 650c side-cast surfcasting reel. 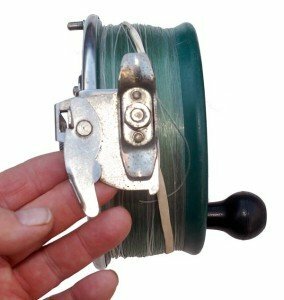 I have used this reel to take a lot of fish from mullet to big sevengill sharks. I mostly fish it on either my 4.8m (16 foot) Kilwell Special, if the sea is rough, or otherwise I use it on my 4.10m (13’4″) Angler Rods Titan. The later being a Genuine Snyder / Glas S 153 8 Wrap made in Australian especially for use with Alvey reels. The match of Angler Rods Titan and Alvey 650c is something special. This rod has written on the blank “made in Australia for N.Z.” A near perfect combination of casting distance, rod power, excellent feel, and light weight – relatively speaking. The rod is designed for line weights between 8 – 12 kg and cast weights of 120 (4.2oz) – 180 (6.3) gsm. With the heavy Kilwell rod I can even fish 8 and 9oz weights, if I need to, in rough surf during a competition. Alvey reels are made in Brisbane, Queensland, Australia. The first thing you need to get right when using an Alvey reel is your choice of rod. You need one with a low-mount reel seat to balance the rod properly. The second thing to get right is to match the weight of the reel to the rod. The combination of Alvey 650c and Angler Rods Snyder Glas Titan mentioned above is about as close to perfect as you can get. This matching of rod to reel is important with Alveys as there is a big weight differential between the small light-weight Alvey estuary casting reels, and their larger and heavier surfcasting side-cast cousins. Alvery 650c viewed from the top. With a line capacity of 650m/9kg, you won’t run short of line. This makes it good for balloon or kite assisted surfcasting. I would use the big Alvey 650c for surfcasting. However, if fishing from the wharf at Mapua, for example, I would use a smaller and lighter Alvey 55C. I would fish the 55C on a shorter 3.0m (ten foot) rod with a low-mount reel-seat. This Alvey 55C combo is a pleasure to use when fishing lighter weights of 28gms (1oz) to 85gms (3oz). It is perfect for wharf, esuuary and light surf fishing. You can still make very long casts if needed but without all the weight and extra effort associated with a heavier outfit. This reel is also still made but in a later version the 55BC weighing only 635gms. Getting back to the Alvey 650c and this question of weight and a balanced outfit. My green 650c weighs 1.227kg (43.3oz or 2 lbs 11oz), and the 55C mentioned above as a reference point weighs 692gms (24.4oz or 1 lb 8oz). So at 1.227kg the Alvey 650c is a fairly hefty reel. It is almost twice the weight of my 55C. Note Alvey have reduced the weight of the newer 650c5 to a mere 1.098kg. This is not meant to frighten. It isn’t as bad as it sounds. In fact, the weight is an advantage when it comes to balancing out a heavy surf rod. The reel is at the fulcrum point. If the reel is too light for the rod it just feels all wrong when casting. The Alvey 650c has a super strong injection moulded fibreglass spool and a stainless steel back. These things are made to last. Even if some of the parts become worn there are plenty of spares available. There are ten washers in the drag system. Some of the washers are brass, some fibre, and in the newer version, one is made from nitrile. The drag is always smooth even when wet. Alvey 650c stainless steel back. On the 650C the clicker only works if you switch it on so you don’t have to hear it when retrieving if you don’t want to. When a fish takes your bait and runs, you can hear the warning clicker and grab your rod from the rod spike. When surfcasting, unless you are getting a lot of quick takes, the rod will mostly be in the rod spike so that weight I mentioned earlier doesn’t come into play most of the time. You will also need a rod bucket, or pouch, to support the weight of rod and reel freeing your hands for baiting up. The rod bucket makes retrieving a breeze. The Alvey 650C casts incredible well. I spool up with 9kg (20lb) monofilament and use a 24kg (50lb) monofilament shock leader about two-rod lengths long. The mono lines are joined with a double blood knot with the tag ends snipped close to the knot. You could use braid if you wanted to. But Alvey advises against it. With an Alvey reel you have to guide the line across the spool with your index finger. If using braid you would have to be very careful to avoid a nasty cut. I don’t use braid on my Alveys. If you have had some experience using braid on an Alvey casting reel please let me know how you got on with it. You can also use your 650c on a short stubby boat rod for sea fishing if you wanted. I wouldn’t be without my Alvey 650C on any surfcasting trip. It has legendary rugged Alvey dependability. 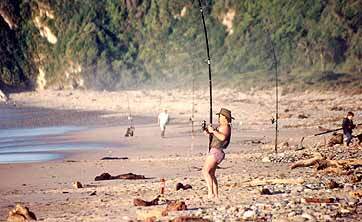 When surfcasting on some isolated beach near Haast, on the South Island’s West Coast, I need a surfcasting reel I can trust. The Alvey 650C will remain my “go-to” reel for some time yet! Spool Diameter: 165mm (6 ½”). 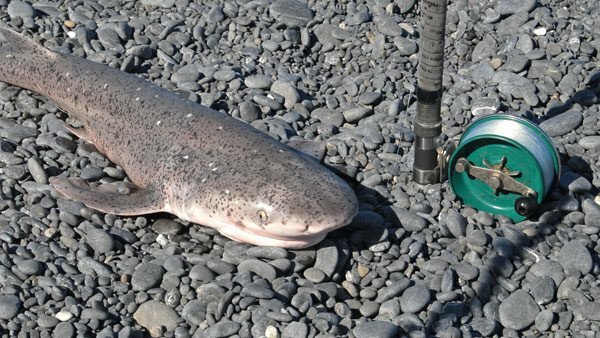 Sevengill shark caught, photographed and released at Kaikoura. Alvey Reels are distributed in New Zealand by Killwell Sports. You can see the Alvey range of products on Killwell’s website.